There are many different costumes from the regions of Spain - two regions are represented on this page, Andalusian and Basque. 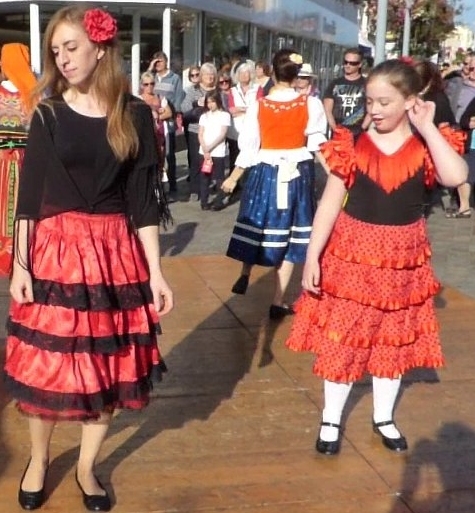 These two costumes are Andalusian; the one on the left dates from the 1950s and was given to us by Kaye Lewis Poole, the other is one of the contemporary girl's costumes sold as souvenirs across southern Spain. There is fringe on the girl's dress and on the scarf of the other outfit, which accentuates the movement of the dance as do the tiered layers of the skirt. Cotton skirt, blouse, headscarf and waistcoat worn with espadrilles. 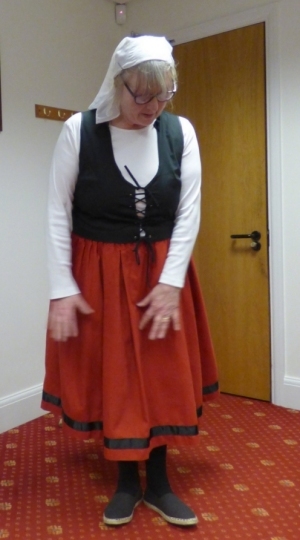 It is virtually the same as the traditional French Basque costume.